This weekend, I finished the launch of a new website for my aviation ad agency. And while this post will be more about advertising than aviation, please stay with me for a while and see where it goes. When we opened our ad agency in 1999, we did not have any aviation clients. But as the years flew by, we picked up several businesses in this sector, and found that the intricacies of the trade demanded creatives who knew aviation well. Along the way though, we found that aviators as business owners didn't really want to spend a great deal of time on their marketing strategies. The process of developing an ad campaign to support their sales department usually was attempted in-house or farmed out to an agency who didn't know that the spinny thing on the airplane always goes in the front (unless it is a Cessna 337 Skymaster, in which case they have a spinny thing in the front AND back) or that hangar is not spelled "hanger". When you go to our new site, it is not going to be a whiz-bang joyride through bells and whistles land. You won't find buggy drop-down menus or rotating banners flashing on all sides of the main window. No flashing lights, dancing ponies or glitchy news feeds. We stripped down the site to the bare bones so that the message would be the star and not the artwork. Early reviews are that we hit the mark, with people saying it is a refreshing change to view a site that loads lighting fast even on their mobiles, gets right to the point instantly, and most importantly, respects the visitors time. If you have ever been involved in the development of a professional website, you know the endless decisions that must be made. There are literally an infinite number of style choices and operational options, and as HTML evolves, each new trick du jour can be added to add crazy visuals to the site. We run a lean, virtual agency, and have developers that can code anything a client needs, if they have the budget to afford the cutting edge functionality that is the latest fad. We design each site – and every piece of printed collateral material – to serve the client's needs precisely. So when you see a simple, clean site like ours that makes our story front and center instead of clutter and eye candy, know that we wanted it this way. Nobody will come away from a few minutes inside our new site with any doubts about what we can do for them, and how we have done it successfully for others. 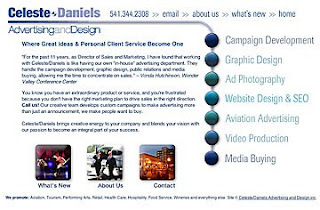 "Celeste/Daniels brings creative energy to your company and blends your vision with our passion to become an integral part of your success." If this site delivers nothing else to the eyes of smart aviation business owners than that quote, it will have done its job. Because when you look under the hood of most businesses, they all could use some new creative energy. The owners all have a vision of what success looks like, and we have the passion for making that vision come to life. Yes, this is a new direction for my agency, a simplified attitude, a vibrant outlook and a focused commitment to convince aviation business that we are not like the other agencies they have tried before. That's because at the helm of this ship is a pilot, and everyone reading this knows how pilots stick together and helps each other out, no matter what.